Are you curious what the deal is about inflammation? And what you can eat to cool it down? Let me make it super simple. Inflammation can be appropriate and helpful when it’s in response to an acute injury. The swelling and redness surrounding a cut on your finger are visible evidence of the body’s troops rushing to heal injury and prevent infection. But what if inflammation goes off the rails? Bacterial or viral infections, chemicals, trauma, stress, an unhealthy balance of gut bacteria, and certain foods, for example, can irritate tissues and cause the immune system to overreact. Chemicals from white blood cells are released into the bloodstream and tissues to protect your body, creating warmth and redness—and potentially causing rather than preventing health problems, including big ticket diseases such as autoimmune conditions and cancer. What can you do? Add anti-inflammatory foods to your diet. There’s no need to adopt rigid restrictions, nor follow a specific “anti-inflammatory diet.” The solution is much easier and much more fun than that! Just learn the foods to adopt, so you have a menu of options to play with and explore. Foods to turn to? You want to include lots of flavonoids, a group of phytochemicals that are important components of many fruits and vegetables and the most powerful antioxidants in our diet. My advice, as always, is to fall in love with vegetables! Learn the many options so you have lots of beautiful options for your palette, and paint your plate with color. When you pack every plate with color, you know are incorporating lots of flavonoids. In other words, superpowers! I want to show you there’s more than just the science. Feel free step out of “diet” mode and into beauty and flavor. The Greek word dieta has as much to do with lifestyle as with food. In fact, let’s just say that it has to do with life! By playing with color, and choosing simple ways of preparing foods, you can make it so easy to incorporate anti-inflammatory, healthy nourishment into your life. Green: kale, arugula, avocado, bok choy, lettuces, chard, collards, beet and turnip greens, dandelion greens, broccoli, Brussels sprouts, Romanesco broccoli, snap peas, cabbages, asparagus, artichokes, watercress, fennel, green tea, parsley, cilantro, basil, rosemary, leeks, scallions, limes, celery. There are so many options! What green floats your boat today? Purples & reds: beets, raspberries, eggplants, strawberries, blueberries, blackberries, purple potatoes and sweet potatoes, red cabbage, purple cauliflower, apples, tomatoes, red & purple peppers, pomegranate, cherries, watermelon, grapes, radishes, cranberries, purple and red carrots, red pears, purple kohlrabi. Yellow, orange & gold: all the winter squashes and many summer squashes, oranges, lemons, yellow and orange peppers and tomatoes, corn, carrots, apricots, peaches, nectarines, cantaloupe, papaya, mango, orange cauliflower, French melons, sweet potatoes, persimmons, Olive oil, turmeric, saffron. Now you get to mix them on your plate! If you mix and match colors in your meals, how dynamic your meals will look. Mixing greens with orange squash in the winter, or radishes in the spring, or tomatoes with beautiful green salad in the summer. And of course, accessorize with spices! Garlic is a major anti-inflammatory food. Try an experiment: Cook for a week with… color! Whether you're in front of the produce at the grocery store or browsing your farm market, what’s fresh and colorful? Arugula, avocado & radish. The dark green, kind of bitter, plus the beautiful fat of the avocado and the crunch and color of the red radish. Love avocado toast? Smoosh the avocado, add the arugula and sliced red radish. Stuff a sweet potato with sauteed chard or your favorite dark leafy green. Sprinkle with pomegranate or dried cranberries. Mint, baby greens, fennel and strawberries. Slaws: red cabbage, herbs (mint, parsley, cilantro), shredded carrots. Or my favorite, shredded red cabbage and shredded beets. Blueberries. Don’t underestimate adding blueberries to a salad or an abundance bowl. They give a pop! Not too sweet, but surprising. Celery, carrots, cucumber, fennel, dill, parsley. This combo says summer. Celery, apples and walnuts. A Waldorf salad. Classic slaws usually aren’t much to get excited about. But that’s not the case here. 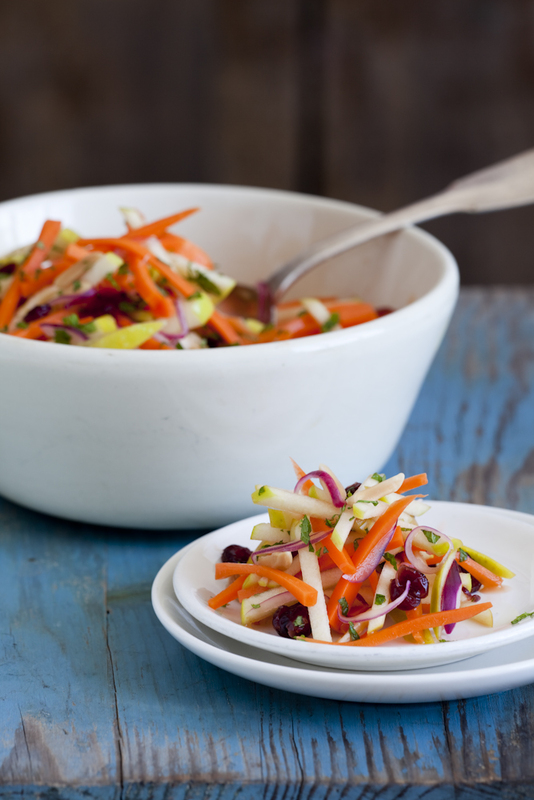 This slaw is a feast for the eyes and palate, with visual zing and a host of delightful contrasts for all of the senses: crispy and chewy, tart and sweet, fruits and veggies—all in one beautiful package. People often tell me that they love salad but get bored with the same old version they always make. 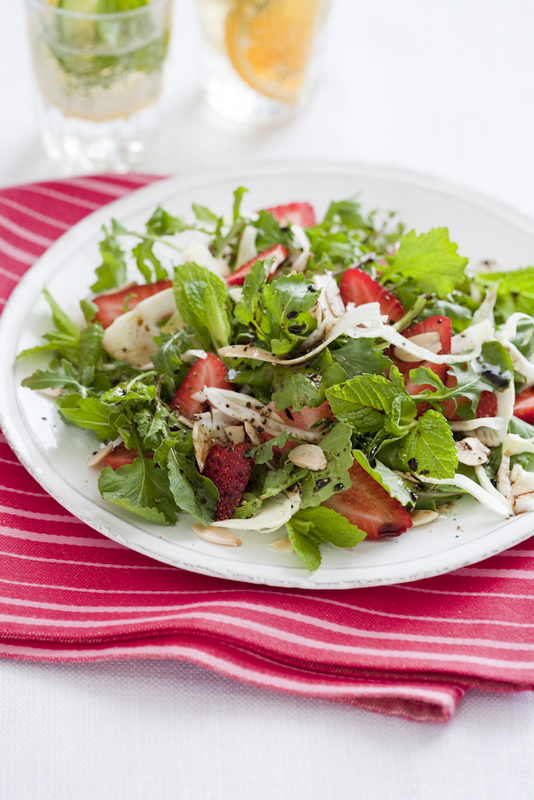 If that sounds like you, let this salad serve as a springboard for endless seasonal variations, such as strawberries and arugula in the spring. In addition to having an incredibly sweet taste, strawberries have anticancer and anti-inflammatory properties. I always think of baked sweet potatoes as little rafts of nutritious delight, carrying numerous other healthy ingredients along for the ride. Chopped herbs, chutneys, veggies, nut creams, yogurt… all are great variations. And so simple to prepare. Bake four, eat one, put the rest in an airtight container, and they reheat in a flash. A great go-to food!